Eighty percent of dogs over the age of eight, and 20 percent of dogs over the age of two are coping with the chronic pain from arthritis every day. These numbers are thought to be even larger, with more studies in progress. Sadly, it is often over-looked and poorly managed. Owners may not be aware of the bigger picture and readily accept that their beloved dog is ‘just growing old’, or ‘just slowing down’. But age is not a disease. Slowing down can be an indication of pain, and arthritis is painful. 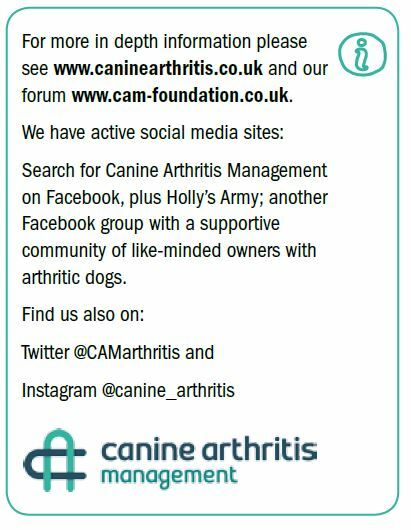 As humans we have a wealth of information and education at our fingertips when we get a diagnosis of arthritis. For our dogs, this is not the case. 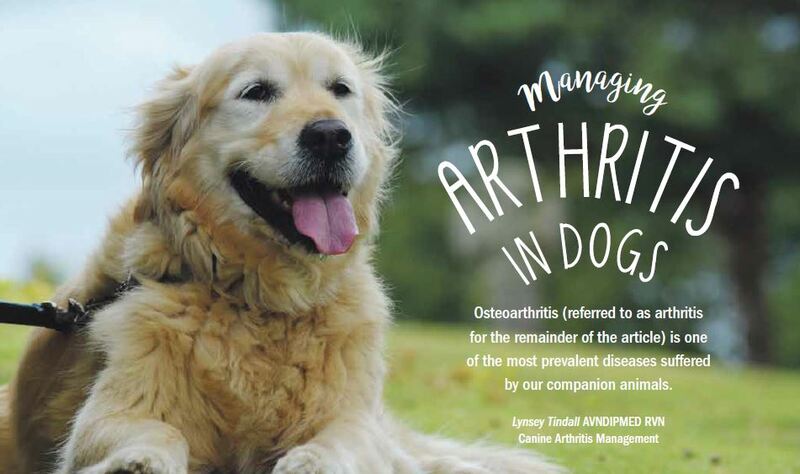 Vet Hannah Capon has recognised this, and has made it her mission to change the way arthritis in dogs is recognised and perceived by both owners and the veterinary profession. 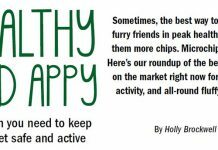 She has set up Canine Arthritis Management (CAM), a veterinary led, social enterprise group run by a team of veterinary professionals, therapists and owners. With a website chock full of advice, tips and tricks to managing this insidious disease and providing your dog with a longer, more comfortable life. Arthritis is one of the main reasons for elective euthanasia in the UK, with dogs presenting ‘off their legs’ and unable to stand. This will not have happened overnight, and will be a result of many years worth of coping and compensation by the dog, who rarely vocalise or complain about long-term pain but instead loyally keep going for their owner and because they know no different. CAM goes as far as to say that arthritis kills. It is not just a disease of the joint, but is debilitating both physically and emotionally to the entire body and mind. 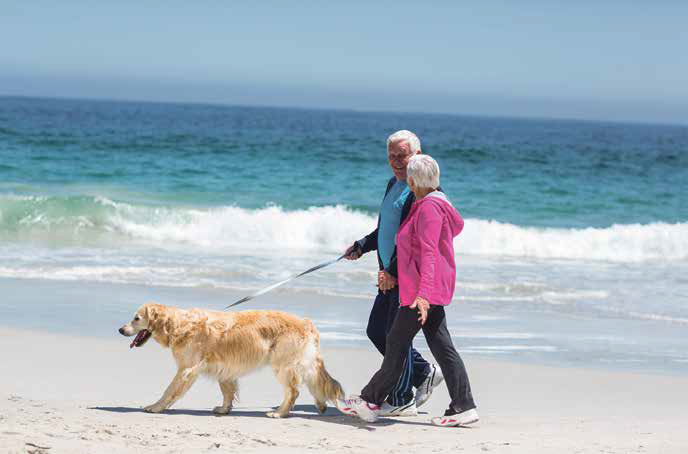 For both dog and owner, its impact is far further reaching than just a sore elbow. So how can you recognise the signs that your dog may be suffering with arthritis? CAM suggests that you look at your dog in four different ways. Behavioural change can often indicate the presence of pain. Does your dog lick their legs, or maybe even their bed? Are they less reluctant to go out for walks now? Have they been nicknamed Mr Grumpy as they are getting older? Are they withdrawing from social interaction both with humans and other dogs? Do they now have to defecate in more than one ‘parcel’, instead dropping smaller ones in different places or as they walk? Have they started hesitating before jumping into the car? Does your dog seem to carry themselves differently? Do they carry their head or tail lower than they used to or does their back seem more rounded? Has your dog changed the way they walk? Do they sway their back end? Do they lag behind on a walk? Do they seem ‘stiff’ or less fluid than they used to? Do they stumble, lose their balance or scuff their toes? Has your dog changed shape? Have they started looking larger over their shoulders, possibly with a ‘mane’ where-as they used to be sleek coated? Do their hindquarters seem smaller with less muscle, or have you noticed loss of muscle elsewhere? With all of this in mind, it is important to obtain a correct diagnosis from your vet. Whilst all of these things can signify pain,compensatory change and the presence of arthritis, your vet needs to be able to rule out other diseases and conditions that can also present in similar ways. 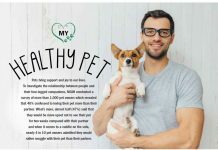 If you can answer yes to many of the questions posed above, book your dog in to see your vet for an assessment. They should ideally suggest blood tests and imaging to help them confirm a diagnosis, rather than treat on just suspicion. There is no cookie cutter solution for treating arthritis. Your vet may prescribe pain relieving medications for your dog. These will not be discussed in this article, but are often the cornerstone for the treatment of arthritis. Always ask your vet for full information on what you are giving and why, to help you understand their importance and use. There is a lot of mis-information on the internet which prevents many owners from using such medications for their pet; the unfortunate side effect being that the dog receives no pain relief at all. 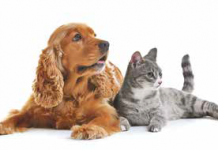 Your vet may also discuss surgery like hip replacements, or some of the more recent advances in regenerative medicine. 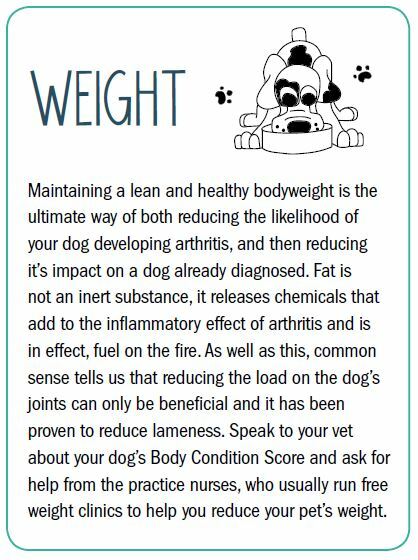 CAM believes that a multi-modal management plan is imperative for coping with arthritis, and a combination of medications and supplements alongside other aspects outlined in this article give you and your dog the best chance at slowing down the inevitable progression of the disease. So, your dog has been diagnosed with arthritis. What next? This can be a worrying and isolating time, as it hits home that your pet and companion is indeed suffering with chronic pain that will only be progressive. It can seem as though your relationship will change; those long walks and carefree days now need more planning and less spontaneity. Activities and hobbies may need some adjustment, or even curtailing altogether. 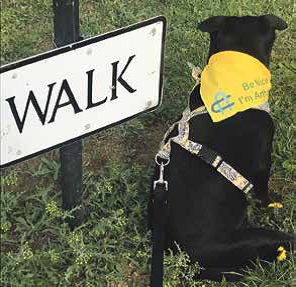 CAM encourages owners to recognise that arthritis is not the end of the road, but just a change in direction. Your relationship may change, but it need not be for the worse. 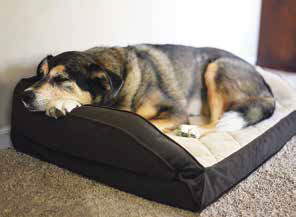 Lifestyle and environment play an important part in the management of arthritis in dogs, and it begins in the home. Home environment: Modern lifestyles see many of us with wooden or tiled floors, and with a dog it certainly makes the cleaning a little easier. However, for an arthritic dog, these floors pose a huge hazard. Slippery surfaces cause repetitive injury, and for a dog already struggling to stay on its feet they can be a daunting prospect. Non-slip rugs and runners provide more stable footing, reduce injuries and give the dog confidence. Keeping claws clipped short and long fur between the pads is also useful, as this to a dog is like walking in socks on a slippery surface. Products used on the dogs pads, and boots are also available, but CAM’s experience has shown rugs and runners are the most efficient way of solving the problem. Stairs and steps are obviously common-place in our homes, but again are a hazard for an arthritic dog. An absence of a braking system, and the fact that dogs carry 60% of their weight on their front end makes them top-heavy for coming down stairs. Slips and stumbles, or even falls are detrimental to the dog and can cause further injury or impact on the dog in the following days. 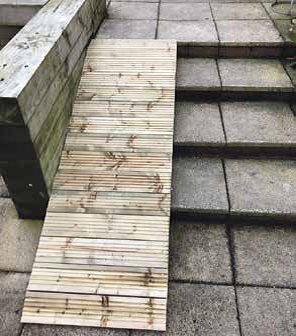 Restricting access to stairs with stair-gates, carrying the dog up and down if possible or even non-slip ramps are all potential answers to this problem. Bedding: We know ourselves that a good quality bed equals good quality sleep. Ensure your dog is able to fully stretch out and is fully supported – try sitting on the bed for five minutes – if you can feel the floor through it your dog probably needs more support! Getting in and out of the bed should be easy and clutter free, avoid too many blankets that may trip, and provide a non-slip surface for them to step out onto. Feeding time: Bowls should again have non-slip areas in front of them for when the dog is eating or drinking. Raising the bowls with a purpose built stand or even on a pile of magazines can be a useful aid for dogs with neck or elbow pain. The use of scatter feeding or interactive feeders like KONGs or puzzle toys and lickmats are incredibly adventagous for a variety of reasons; providing mental stimulation for those less able to exercise, allowing less food to be consumed if on a weight loss diet, gentle exercise and for distraction; which in itself can be an amazing tool for providing pain relief. The ‘feel-good factor’ that many dogs have from just the mere anticipation of food can be harnessed here, with the production of serotonin thought to modulate the perception of pain. Exercise: How long is a piece of string? Exercise regimes can vary widely according to the dog’s capabilities. The general rule of thumb; if your dog is starting to tire and lag behind at any point in the walk, you should have already turned for home. Keep track of the time and shorten the walk next time. Arthritis waxes and wanes, giving both good and bad days. Assess your dog at home before the walk, when adrenaline kicks in and makes them over-look their pain and lead to over-doing things that they may pay for later in the day. Avoiding high impact games like ball throwing (launch that ball-launcher into oblivion, now!). If your dog is ball obsessed, replace the chase with hide and seek for example. Consider walking companions; is a healthy dog too boisterous, and can the arthritic dog keep up with the pace and the distance? Remember, your dog will follow you to the ends of the earth and just cope. Think about his capacity for the type and length of walk. Consider terrain, soft grass is easier than pavements and flat sand more manageable than stones or deep sand. How do you get your dog to their walk? Jumping in and out of cars has a huge effect on their skeletal system and joints, think about ramps, parking close to a high verge or lifting the dog in and out instead and ensure the travel space is supportive and comfortable. In summary, there are many aspects to managing a dog with arthritis. Simple home and lifestyle changes should not be underestimated for the impact they can have on a dog’s pain status. By employing these basic adaptations, you can make a significant difference to your dog, and slow the progression of this debilitating disease. 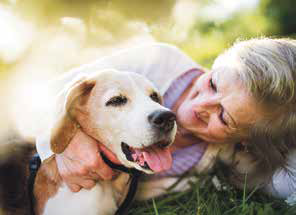 Combined with veterinary prescribed medications and support, complementary therapies such as hydrotherapy and massage, you can be proactive in giving your dog, more years.